Emerald Isle, North Carolina! I propose to you that it is one of the most perfect family vacation places ever! 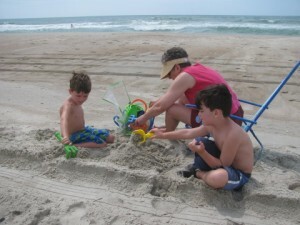 It is family-friendly, has great beaches, nice surf, and not much else to do. Last week my wife, three kids and I made our third trip there…and each time seems better than the last. Listen with your eyes, ears and heart. Only 7% of communication is the words, 38% is tone of voice, while a whopping 55% are the non-verbals…including what is not being said. Get on the floor and do a puzzle. I really didn’t want to at first…but my insistent 4 year old convinced me. I had a great time, and so did he! He asks me all the time at home and I usually blow it off because I “have to do something right now”. We were only together for a few minutes, but the engagement was authentic and fun. This was a “memory making” moment! I vow to do puzzles with him even when I am not on vacation. Uncle Nathan is invaluable. As a parent I spend a lot of time setting limits and boundaries with my kids. I don’t know if it has ever happened to you, but I get the feeling they tune me out after about the hundredth time I say the same thing. Uncle Nathan silenced all three boys at once when he said, “Your mom already said you can’t have another fudge cookie, so the answer is ‘no’.” Wouldn’t it be great if all of the adults in our kids’ lives backed us up like that? Who else can I include in my kids lives who has good boundaries and can help form a big circle of support around each of my boys? Creativity from boredom. “Daddy I’m bored, can I play the DS?” says my oldest. “No, you have already played the DS.” This little scene repeated itself several times before he figured that I wasn’t going to be swayed, but in the interest of time I’ll skip to the conclusion – 15 minutes later, he was making a “racetrack” around the house with his little brothers, and when they finished with that, they went outside and drew on the sidewalk with the chalk their grandma gave them! None of them seemed bored to me…in fact they seemed happy. Less DS, more creative play! Vacations have value besides naps and new scenery. The new perspective they provide helps us to remember what is really important. Try a new perspective on the vacation that you take this summer…look at it as a learning intensive time. It is fun to learn, especially on an island! 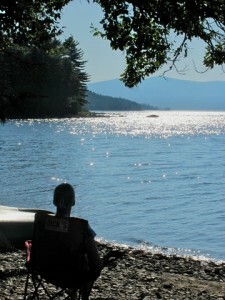 RELAX, BREATHE, MAKE SPACE… “NATURE’S RHYTHM IS MEDIUM TO SLOW” … IT ALLOWS US TO ENGAGE OUR CREATIVE MIND…AND TO REST! AND A TRIP TO AN ISLAND IS WORTH THE JOURNEY! David LePere is the executive director of Cherokee Creek Boys School, a therapeutic boarding school for middle-school boys ages 11-15 in Westminster, SC.